CAPE CANAVERAL, Fla. — The stormy weather hasn't stopped the flood of tourists from flocking to NASA's Kennedy Space Center, with thousands of spectators hoping for one last chance to see a space shuttle blast off on Friday (July 8). The shuttle Atlantis is poised to launch at 11:26 a.m. EDT (1526 GMT) on NASA's final space shuttle mission before the fleet of reusable space planes are retired for good. Bad weather has been a constant concern and currently, there's a 70 percent chance the launch will be delayed. A pair of lightning strikes near the space shuttle on Thursday (July 7) caused some angst late in the day, but an early assessment found the spaceship in good health. Despite the dismal weather forecast, NASA still expects a record turnout. The space agency estimates that between 750,000 and 1 million people will converge on the coasts and viewing sites around Kennedy Space Center tomorrow in the hope of glimpsing a shuttle launch for the last time. Media outlets have packed NASA's press site here, too, with nearly 2,700 reporters requesting credentials to attend what promises to be a historic launch moment. Space shuttle Atlantis is revealed at Kennedy Space Center's Launch Pad 39A following retraction of the pad's Rotating Service Structure on July 7. Atlantis' final mission will be a 12-day trip to the International Space Station to deliver equipment and supplies that will be vital for keeping the orbital lab going after the shuttle program ends. The flight is Atlantis' 33rd flight and NASA's 135th shuttle mission since the fleet first began launching into space in April 1981. Veteran NASA spaceflyer Chris Ferguson commands a skeleton crew of four astronauts for Atlantis' final mission. Shuttle pilot Doug Hurley and mission specialists Sandra Magnus and Rex Walheim round out the crew. "Thanks, everyone for all the well-wishes!!!!" Magnus wrote in a Twitter post, where she is chronicling her spaceflight under the name @Astro_Sandy. "We really appreciate it and are glad so many people are interested in the space program!!!" NASA invited 150 Twitter users to the launch site this week for a two-day "tweetup" to watch Atlantis' final flight. Today, NASA's deputy chief Lori Garver spoke to the group, as well as several active astronauts and Elmo, the short red puppet from Sesame Street, who is also attending the launch. 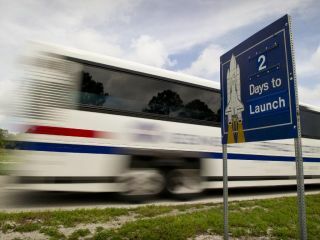 So much traffic is expected that NASA is considering skipping a day between launch attempts if there's a delay tomorrow, just to allow shuttle workers extra time to get home and rest up for another try, officials have said. Leinbach said he perfectly understood why so many spectators are hoping to check off seeing a shuttle launch from their "bucket lists." The iconic image of a NASA space shuttle soaring into space will soon be history. "Anyone under the age of 30 has always had the shuttle program as part of Americana, and we won't have that anymore," Leinbach said. NASA is shutting down its space shuttle program after 30 years to make way for a new plan to send astronauts on deep space expeditions to asteroids and Mars. That deep space exploration plan was unveiled by President Barack Obama last year after he canceled NASA's previous moon-oriented program. The decision to retire the shuttle fleet, however, was made in 2004 by former President George W. Bush in the wake of the 2003 shuttle Columbia tragedy. NASA and its contractors expect to lay off thousands of shuttle workers once the program retires, a fact that sometimes weighs on the team. "It gets more and more somber the closer to the end it gets," Leinbach said. The future will be a different one, Leinbach and other shuttle officials said. Instead of a winged spaceship, NASA is building a new capsule called the Multi-Purpose Crew Vehicle to fly astronauts to asteroids or onto Mars. The agency plans to use private spaceships to fly NASA astronauts to and from low-Earth orbit. The first crewed flights of any of these vehicles are still years away, so NASA plans to rely on Russian Soyuz capsules for crew flights and robotic cargo ships built by Russia, Japan and Europe for space station deliveries. The remaining three shuttles will be sent to museums for public display once they complete their final missions. Atlantis will stay in Florida and be displayed near its homeport at the Kennedy Space Center visitor's complex. The other two shuttles are bound for museums across the country. Even at NASA the desire to get close to the shuttles before they stop flying is strong. In a press briefing this week, Leinbach said he took time to say farewell to Atlantis in his own way. Thousands of NASA employees and their families turned out to watch the shuttle roll out to the pad in June, with the agency staging several photo sessions to give workers a parting glance. "We've gone quite the extra mile to see that people are able to celebrate this fantastic machine," Leinbach said. You can follow SPACE.com Managing Editor Tariq Malik on Twitter @tariqjmalik. Visit SPACE.com for complete coverage of Atlantis' final mission STS-135 or follow us @Spacedotcom and on Facebook.